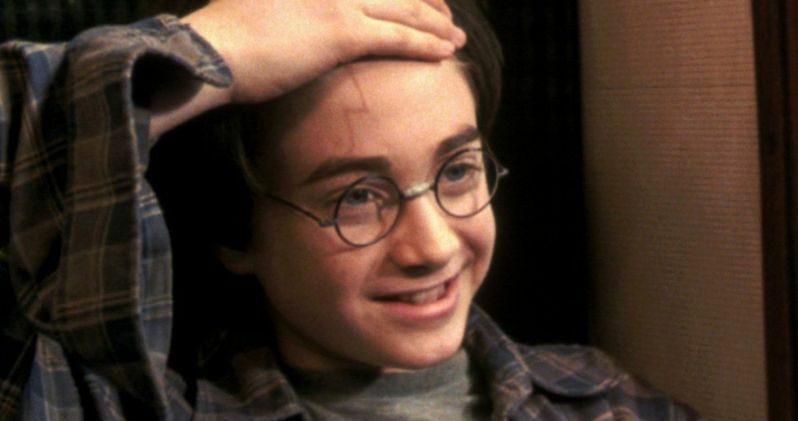 Could it be that there is a deeper meaning to Harry Potter's famous lighting-shaped scar? As with any major fandom, there are near countless things to dissect and wonder about within the Harry Potter universe. Fortunately for Potterheads, creator J.K. Rowling is quite great at being an ambassador for the franchise, offering up answers to many of these burning questions. Or, in some cases, questions we never knew we had (such as explaining that wizards used to just go to the bathroom on the floor at Hogwarts). Now, she may have to weigh in on something that is being discussed amongst the fans. Recently, the Today Years Old Twitter account shared a post that stirred the pot. On the left, we see an image of Daniel Radcliffe as Mr. Potter showing off his infamous scar. On the right, we have an image from the Harry Potter wiki showcasing the hand movement for the dreaded killing curse. The post was shared with the following caption. "Did you know Harry Potter's scar isn't a lightning bolt, but actually the hand motion to cast Avada Kedavra?" Needless to say, many minds were blown by this possible revelation, based on the replies to the tweet, which consisted of quite a few shocked reaction memes and gifs. In the Wizarding World, Avada Kedavra, commonly known as "the killing curse," according to Pottermore is a "Powerful curse which instantly kills the victim." Hence, the nickname. This scar theory, if true, would be huge, given that this is the exact curse that Voldemort was trying to use on Harry to kill him as a baby. But is this simply a fan theory or is there more to it? To be fair, this isn't the first time this possible revelation has come up. A Reddit thread that dates back to 2015 also tackled the topic. But, as these things often go, not everyone becomes aware of them right away and the rest of us are caught off guard. J.K. Rowling actually addressed this, sort of, in a fan chat back in 2007 and, if we take the author at her word, then this is actually nothing more than a fan theory. Rowling was asked about the choice to make the scar in the shape of a lightning bolt. Here was her answer. Taken at face value, this at least means that J.K. Rowling didn't intend for the scar to carry this deeper meaning. It's also been pointed out that, at least in the movies, Voldemort, as portrayed by Ralph Fiennes, doesn't actually use the same hand motion shown in this tweet when he attempts the killing curse. Still, as fan theories go, this is pretty compelling. And really, all Rowling would have to do is step in and sign off on this theory to make it part of the official canon. Given how involved she is with the fandom, not to mention that she's been writing the Fantastic Beasts movie scripts on her own, it wouldn't be surprising to hear her address this in the near future. Feel free to check out Today Years Old's Twitter post below.